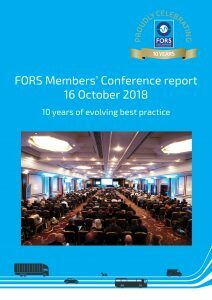 The FORS Members’ Conference report has now been published. In the comprehensive account of the event, the report outlines the highlights from the day and provides a recap of the latest FORS developments, including the launch of version 5 of the FORS Standard. The third annual conference, held on Tuesday 16 October at the National Conference Centre, Solihull, was attended by over 450 delegates, and was described as the ‘biggest and best’ yet. The conference also celebrated the 10-year anniversary of FORS, its evolution to date and a future vision of the scheme. To read the post-conference report and to view some photos from the event, visit our conference page here.